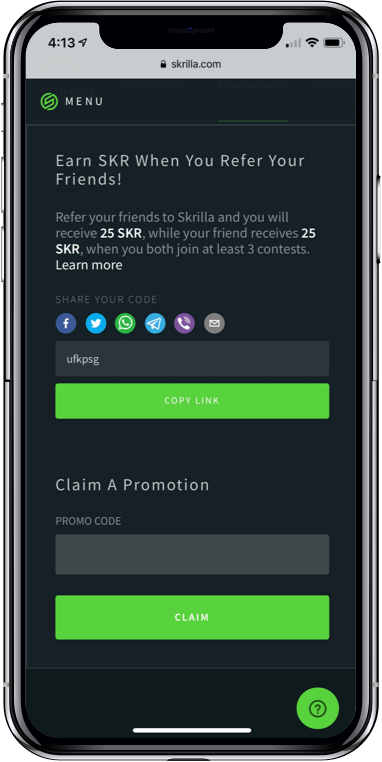 We are happy to announce we have just launched phase one of Skrilla Promotions, which now allows users to earn SKR when they invite friends to join the festivities 😎. For each friend you invite, you both earn 25 SKR, which has a Skrilla Marketplace value of roughly $5 USD each. To checkout what you can spend it on visit here. Navigate to the Promotions page from the main menu. Each user receives a unique referral code. You can share the code with your friends. b) They can enter the code on their Promotions page. You can refer as many legit friends as you want. A user can only claim a single Refer-a-Friend code. Both you and your friend/s will receive the Promotional SKR after you both have entered 3 or more contests. Refer a friend is the first phase of SKR Promotions. We have a range of exciting ideas, many of which have been provided by the community, which we are implementing. Allowing users to earn SKR in a number of ways which grow the platform.